We're a little more than a month away from the 8th annual A3c Hip Hop Festival set to rock Atlanta from October 11-13. The festival returns this year with a lineup that boasts a fine variety of over 300 heavy hitters and rising up-and-comers including Raekwon, Slum Village, Devin the Dude, Tech N9ne, Ab-Soul, 9th Wonder, and Killer Mike, performing on six stages over three days. That's not including a few soon-to-be announced performances as well. $65 for a three-day pass to a hip hop festival with this year's lineup is beyond impressive in this day and age (and that's with a collectible woodallion too) but the folks at A3C are always taking things a step further. For the next 24 hours, A3C will give all ticket buyers $10 off the purchase price of a 3-Day Pass when you use the promo code EMA3C at checkout. Act quick, passes are selling fast and prices will go up as the festival nears. To purchase your tickets, go directly to the A3C site here and secure your spot at this year's festival. 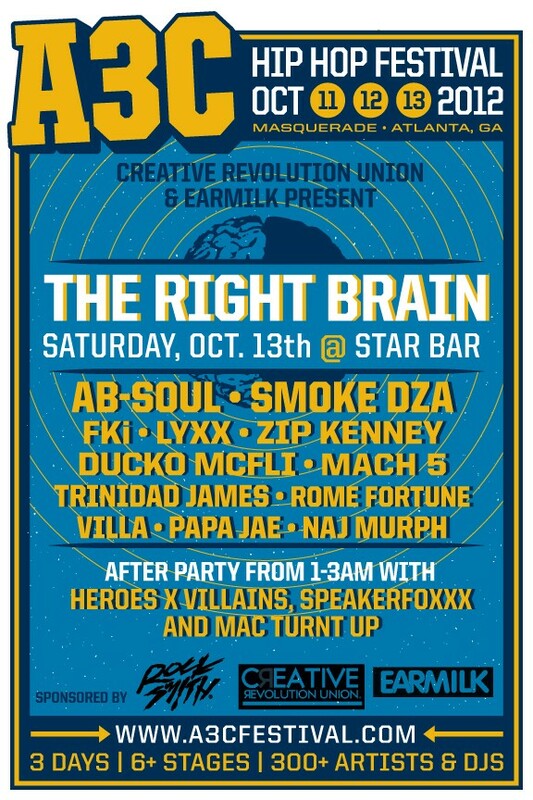 Check back for more announcements about the Rocksmith-sponsored The Right Brain Showcase presented by Creative Revolution Union (CRUx) and EARMILK, as well as a comprehensive pre-festival preview of the showcase's performers. Chance Fischer serves up his own "Souffle"